Two single mothers combine their households to help support each other through difficult times – one, an aspiring actress with a cute blonde daughter, the other a homeless black woman willing to work for her keep, and that of her-light-skinned daughter. There are two important mother-daughter relationships at play here, but the way those relationships intersect is also pretty astonishing for a movie made in 1959. 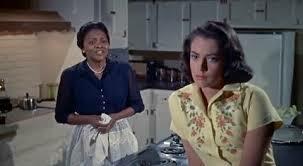 As Lana Turner as Lora Meredith begins her ascent to fame, Annie (Juanita Moore) becomes relegated to loyal employee. It’s obvious to all the two are friends, and that Miss Meredith depends fiercely on Annie, but this can never be a relationship between equals. The two little girls, raised under the same roof as playmates and friends, are on more even footing, but though young Sarah Jane can pass as white, she isn’t. Point blank. And in 1959, that’s quite an obstacle. Annie is a maternal presence to both young girls, running the household and being available for physical affection whereas Miss Meredith is more keen on being the provider. She’s not exactly cold, but she is focused on her career and willing to send her daughter away to school for her own convenience. Together these two women manage to fill out each other’s strengths and weaknesses but there’s one sticking point that neither can hope to change. Sarah Jane prefers to deny her mother, her roots, and her own race. Since she can pass as white, she plans to, and does everything she can to reject her mother and keep her secret safe. Meanwhile, the biggest problem that Lora and daughter Susie (Sandra Dee) eventually face is having fallen in love with the same man. 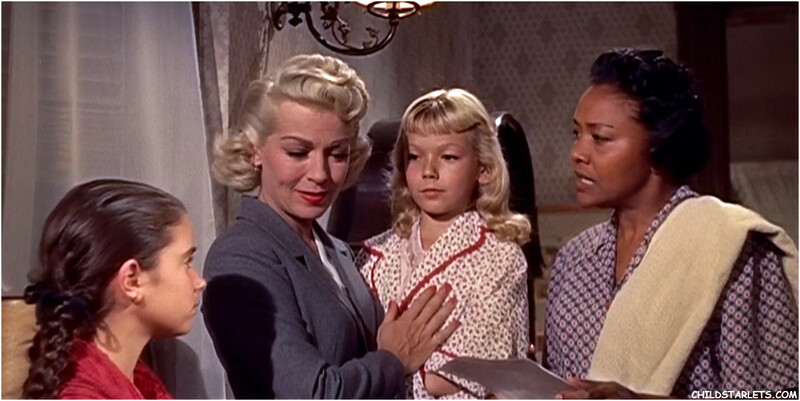 It feels like director Douglas Sirk is actually daring to draw attention away from Lana Turner by giving more screen time, and juicier plot lines, to the film’s two black characters (Susan Kohner, as Sarah-Jane, is actually of Mexican-Jewish descent). The audience never experiences Sarah-Jane’s identity crisis from her own point of view but rather we’re forced to interpret it through a 1950s lens. We do feel it personally, though, through a mother’s heart ache. This earned both Moore and Kohner Academy Award nominations for best actress that year, though of course neither won. This movie requires some analysis, and there’s a level of hypocrisy that must be navigated. 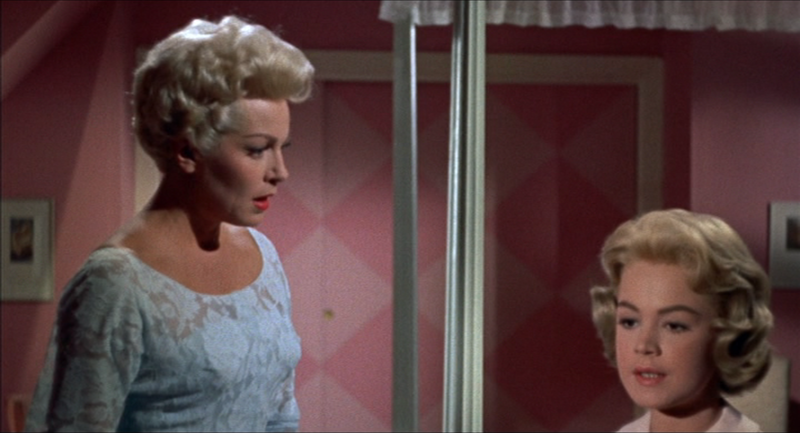 Actually, I think Sirk was a bit of a cynic because there’s a hopelessness to this movie that really got to me. He presents us with racial tensions and materialistic values that both pale in comparison to the underlying vibe that families are being torn apart, their bonds degenerating even in the time it takes to make a film. Lana Turner’s real-life 14 year old daughter Cheryl had just fatally stabbed Turner’s boyfriend (she was let off, justifiable homicide they called it, since the boyfriend was beating her mom up at the time). Nevertheless, this caused a serious rift between mother and daughter, and threatened Turner’s career until Sirk convinced her to channel her pain into a movie about the struggle between mothers and daughters. And here we are. This entry was posted in Jay and tagged mother daughter movies, social issues on March 24, 2015 by Jay. I really like this movie. I think it was about as daring as it could be given the era in which it was made. I have never heard that story about Turner so I didn’t have the same view of the director you do, but that’s certainly an interesting angle.